Assistance for educational expenses from the Taxpayer Relief Act of 1997. The result is homework for parents and their financial advisors in deciding what benefits are best. The educational IRA is a bit of a tease, but Congress may seek to increase the amount that can be contributed. The degree to which the IRS has entered the realm of college incentives is truly unprecedented. Let us see how much assistance was provided from the Taxpayer Relief Act of 1997 (TRA97). IRC section 25A is new and its provisions generally apply to expenses paid after December 31, 1997. The Hope Scholarship Credit (HSC) and the Lifetime Learning Credit (LLC) have fundamentally the same definitional components but differ as to eligibility requirements and credit maximums. The maximum per student credit allowed under the HSC is $1,500. The amount is computed as 100% of qualified expenses up to $1,000 plus 50% of qualified expenses over the first $1,000 but not to exceed the limit of $2,000. Example 1. Ernest and Betty Dunn pay $3,000 in tuition for their son, Chris. Example 2. Same as above except the Dunns pay $1,800 in tuition. The HSC is allowed for only two taxable years and only for the first two years of post-secondary education. Current juniors and seniors are out of luck. The eligible student must be at least carrying wQ the normal full-time workload for the course of study being pursued. The credit shall be denied if a student is convicted of a Federal or state felony offense of possession or distribution of a controlled substance before the end of the tax year. It would appear a student who has had any prior drug conviction in any year would be not be eligible. * any dependent of the taxpayer with respect to which the taxpayer is allowed a deduction under IRC section 151, at an eligible educational institution. Qualified expenses will not include expenses for courses involving sports, games, or hobbies, unless such courses are required for graduation. Aerobic exercises, golf techniques, racquetball, and squash course fees will not count unless the institution requires physical education credit for graduation. The effective date of the HSC generally applies to qualified expenses paid after December 31, 1997. This is in contrast to the LLC described below that applies to expenses paid after June 30, 1998. The credits are non-refundable. After the year 2000 the amount of expense limits are adjusted for inflation. Example 3. David Brown files a single return, has a modified adjusted gross income of $44,000, and pays $20,000 for his daughter's freshman year at Stanford. The amount of HSC is $900. The maximum credit prior to the reduction is $1,500. The reduction percentage of 40% reduces the HSC by $600. The LLC for any taxpayer for any taxable year is an amount equal to 20% of qualified tuition and related expenses paid by the taxpayer during the tax year but not exceeding $5,000 ($10,000 in the case of taxable years beginning after January 1, 2003). In contrast to the HSC, which is per student, the LLC is per taxpayer. 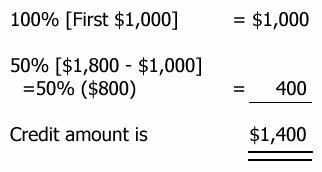 One could argue the case that for married taxpayers filing a joint return the credit maximum could be $1,000 for each of them. The credit is non refundable. If a taxpayer claims a HSC with respect to a student (or claims an exclusion for certain distributions from an educational IRA), the LLC will not be available with respect to that same student for that year. However, taxpayers will be able to claim the HSC and LLC for different students in the same tax year. The LLC is subject to the same phase out range that applies to the HSC. Ernest and Betty must reduce their qualified educational expense amount by $1,050 and thus only $2,450 qualifies for the LLC. The amount of the credit is 20% of $2,450 or $490. Any scholarship received or moneys received, which are excluded from gross income, will reduce the amount of qualified educational expenses. However, if a dependent pays for part or all of the educational expenses, that portion paid by the dependent will be attributed to the amount paid by the taxpayer claiming the dependency exemption. In addition, payments made by the taxpayer during a taxable year for an academic period that begins within the first three months of the next tax year will be attributed to the tax year in which the payments were made. Parents should consider paying for the spring term during late December to maximize their credits. The exception to the above is for the initial year of the credits. HSCs and LLCs have different effective dates. Payments made after January 1, 1998 qualify for the HSC and payments made after June 30, 1998 qualify for the LLC. There are other special rules to consider. Married individuals must file joint returns for credit purposes. An inflation adjustment provision has been included but only for tax years beginning after 2001 and for tax credit limits as well as modified adjusted gross income limits. Qualified tuition and fees paid with the proceeds of a loan generally are eligible for the HSC and LLC. This will allow taxpayers to claim the credits during the years they may need the money the most for college expenses. Loan payments are not considered payments that qualify for the credit. Furthermore, no reduction of qualified expenses is required because of a gift, bequest, devise, or inheritance. * The LLC varies with the amount of qualified educational payments, not the number of students. * There is no limit on the number of years the credit may be adopted. * The LLC is available for years after the freshman and sophomore years; thus graduate expenses will count towards the credit. * Expenses may be incurred for any course of instruction at an educational institution to acquire or improve job skills of the individual. CPE credit and non-credit professional seminars provided by educational institutions will qualify as qualified educational expenses. Qualified State Tuition Programs (QSTPs) are programs established and maintained by a state or agency or instrumentality whereby parents may prepay their child's college tuition. Although QSTPs have existed for a few years, they are a recent phenomena for the IRS. As with most new tax concepts, changes and modifications are an inevitable consequences of development, and QSTPs are no exception. The idea behind tuition programs is the ability of parents to lock in a set tuition price for their children. With the ever increasing cost of college and university tuition, parents were seeking ways to guarantee the affordability of college education and thus the birth of the QSTP. The TRA97 added room and board, but only to the extent of the minimum room and board allowance applicable for the institution's cost per the student financial aid application. The list of previously accepted qualified higher education expenses included tuition, fees, books, supplies, and equipment required for enrollment or attendance of a designated beneficiary at an eligible institution. Designated beneficiary means the individual designated at the commencement of participation by the contributor. The IRC does not restrict the advantages of a QSTP to parents of prospective college bound sons and daughters. In fact, there is no restriction as to who may contribute to the prepayment program. Of course, each state may impose their own set of restrictions for the eligibility of contributors. However, the IRS does place restrictions on rollovers or changes in designated beneficiaries. Taxpayers have 60 days to transfer a distribution to another designated beneficiary, and taxpayers have the ability to change designated beneficiaries as long as the new beneficiary is a member of the family of the old beneficiary. Failure to comply with the family membership rule will result in the distribution being included in gross income of the distributee. Family member means an individual who bears a relationship to another individual that is a relationship described in paragraphs (1) through (8) of IRC section152a and the spouse of any individual described in those paragraphs. A distributee who uses distributions from a QSTP to pay for qualified tuition and fees will be permitted to claim a HSC or LLC. Previous law treated contributions to a QSTP as an incomplete gift and included the value of any interest in any QSTP within the gross estate of the contributor for estate tax purposes. The TRA97 treats any contribution to a QSTP as a completed gift of present interest when made. Thus any contribution made is not considered part of the decedent's gross estate. However, contributions made are deemed gifts subject to the gift tax rules. Contributions are eligible for the annual exclusion provided under IRC section 2503(b) [$10,000 exclusion for a single person or $20,000 for a married couple electing to take advantage of the gift splitting provision]. Individuals who wish to make a one lump sum payment for their dependent may elect to average the payment as if it were made over a five-year period. For example, Mr. and Mrs. Broach pay $100,000 into a QSTP for their daughter. The Broaches elect to use the gift splitting and the five-year averaging rules. The $100,000 payment is deemed to be a $20,000 gift for each of the next five years. The $20,000 gift-splitting rule eliminates any of the $20,000 being subject to the gift tax in any of the next five years. If Mr. and Mrs. Broach contributed $130,000 in a lump sum payment, $30,000 would be considered an overpayment and subject to gift tax. If the contributor dies during the five-year period, any portion of the contribution not previously allocated is included in the contributor's estate. For example, in 1998 Ms. Kelly contributed $60,000 in a lump sum payment for her niece. Ms Kelly elects the five-year rule and $12,000 is considered the contribution per year. During the first year, Ms. Kelly also elects to use the annual exclusion of $10,000 and only $2,000 in 1998 is considered a present gift subject to the gift tax. Ms. Kelly dies during 1999. This results in another $2,000 gift for 1999 but $36,000 is included in Ms. Kelly's estate [$60,000 - $24,000]. No gift tax or estate tax will apply to a transfer by reason of a change in the designated beneficiary or a rollover to the account of a new beneficiary but only if this new beneficiary is within the same generation as the original beneficiary. Gross income of an employee does not include amounts paid or incurred by the employer for educational assistance to the employee. The maximum exclusion remains at $5,250. This exclusion was terminated on May 31, 1997, but was reinstated by the TRA97. Tuition, fees, books, supplies and equipment are considered appropriate expenditures. However, graduate expenses remain ineligible for the income exclusion. The 10% early withdrawal penalty applied to IRA distributions for people who have not reached the age of 59 wQ does not apply to distributions from an IRA for qualified higher education expenses paid for the benefit of the taxpayer, the taxpayer's spouse, or any child or grandchild of the taxpayer or taxpayer's spouse. Qualified higher education expenses are defined in the same manner as expenses permitted under the QSTP. The House Committee specifically referred to graduate level courses as expenses, which are within the scope of educational expenses deemed appropriate for penalty avoidance for early IRA distribution. IRAs for education will be available for tax years beginning after December 31, 1997. TRA97 creates a new IRA hereinafter referred to as an "educational IRA." The weakness in the educational IRA is with the aggregate limitation of $500 [cash only] per beneficiary under the age of eighteen. The contribution itself is not a deduction toward adjusted gross income but the earnings in the IRA will be distributed tax free provided they are used to pay the beneficiary's qualified educational expenses. Although perhaps limited in benefit, the educational IRA is not limited in complexity. Educational IRAs must be created exclusively for the purpose of paying qualified higher education expenses. Although the maximum amount permitted as a contribution is $500, there is a reduction formula based upon modified adjusted gross income in excess of $95,000 ($150,000 in the case of a joint return). The reduction ratio is 60% ($6,000/10,000). The reduction amount is $300 (60% x $500). This is a fair amount of computing for a $200 contribution that would save someone in the 31% tax bracket, with a interest rate on savings at six percent, about $3.72 in taxes after the first year. Distributions are included in the gross income of the distributee in the manner applicable to employee annuities and distributions under employee plans. In general, distributions are not included in gross income if the distributed amounts are less than the qualified higher educational expenses. However, distributions in excess of qualified higher educational expenses are includible in gross income and also subject to the ten percent tax associated with premature withdrawals. This ten percent additional tax will not be imposed if the distribution was made to a beneficiary or the estate of a designated beneficiary due to death; disability; or made on account of a scholarship, allowance, or payment described in IRC section 25A [HSC and LLC]. Any excess contribution is subject to a six percent excise tax. When taxpayers are faced with excess contributions for a particular year, they may withdraw the excess contribution for that year before the filing due date of the return. Any income earned on the excess contribution will become taxable income to the contributor. Taxpayers are permitted to rollover amounts within an educational IRA. The transfer may be deposited into another educational IRA for the benefit of the same beneficiary or a member of the family of the original beneficiary. To avoid any taxation, the rollover must be completed within 60 days of the distribution. A change in a beneficiary of an educational IRA is not considered a distribution if the new beneficiary is a member of the family of the old beneficiary. A contributor may not contribute to an educational IRA in any tax year if during that same tax year a payment was made on behalf of that same designated beneficiary to a QSTP. Earnings are not excluded from gross income of the designated beneficiary if the HSC or LLC was claimed on behalf of that same individual. The interest deduction is also subject to a phase out reduction if a taxpayer's modified adjusted gross income is over $40,000 ($60,000 in the case of a joint return). The amount of the reduction is determined by the ratio of the amount of the excess over $15,000. Modified adjusted gross income means adjusted gross income after applications of IRC section 86 (Social Security and tier 1 railroad retirement benefits); IRC section 219 (deductions for IRA contributions); IRC section 469 (passive activity losses and credits); but without regard to IRC section 221 (educational interest deduction); IRC section 135 (U.S. Savings bonds income used to pay educational expenses); IRC section 137 (adoption expenses); IRC section 911 (exclusion for foreign earned income and housing); IRC section 931 (exclusion for income from sources within Guam, American Samoa, and the Northern Mariana Islands); and IRC section 933 (exclusion of income from sources within Puerto Rico). A deduction is allowed for interest paid by the taxpayer during the taxable year on any qualified education loan on behalf of the taxpayer, the taxpayer's spouse or any dependent of the taxpayer as defined by IRC section 512. However, no interest deduction shall be permitted if the dependency exemption may be allowed to another taxpayer. Presumably, this would be the case when divorced parents negotiate an arrangement where the custodial parent files head of household and the non-custodial parent claims the dependency exemption. There is a 60-month limit in which payments for educational loan interest will be permitted as a deduction. The 60-month period does not have to run consecutively. If a student pays a loan for two years after graduation and then obtains a deferral to graduate school or join the military, the months during the deferral period will not count toward the 60-month limit. A qualified loan means any debt incurred to pay qualified higher education expenses on behalf of the taxpayer, the taxpayer's spouse, or any dependent of the taxpayer at the time the debt was incurred. The loan could have been obtained before or after the school expenses were incurred but the loan funds must be used to pay for the eligible educational expenses while the taxpayer, the taxpayer's spouse, or dependent, was an eligible student. Taxpayers may refinance indebtedness for qualified educational loans but no borrowings are permitted between related parties as defined by IRC sections 267(b) or 707(b)(1). If a parent borrows from a controlled corporation or partnership or if a student borrows from a grandmother, regardless of the legal formality of such loans, the loans are not considered qualified educational loans and no deduction for interest is permitted. Qualified higher educational expenses mean the cost of attendance at an eligible educational institution. The cost includes tuition, room and board, fees, books, and supplies, but a reduction must be made for any amount excluded from gross income under IRC section 127 (employer-provided educational assistance); IRC section 135 (U.S. Savings bond interest used to pay higher education costs); IRC section 530 (educational IRAs) or by an amount for HSCs and LLCs. An eligible institution is not only those as defined in IRC section25(A)(2) [This section includes most post-secondary educational institutions and certain vocational schools.] but also includes institutions with internships or residency programs leading to a degree or certificate awarded by an institution of higher education, a hospital, or a health-care facility that offers postgraduate training. An eligible student is defined in IRC section 25(A)(b)(3). There are a series of miscellaneous rules within the educational interest deduction section of the Code. No double benefits are allowed. For example, a homeowner who has taken out a home equity loan to pay for educational expenses may not claim a home mortgage interest and an educational interest deduction. Married taxpayers must file a joint return to deduct educational interest. A cost of living adjustment will be instituted for tax years beginning after 2002. Richard E. Hurley, PhD, CPA, Esq., is an associate professor at Francis Marion University, Florence, SC.